As promised, Microsoft has released Internet Explorer 10 Preview on Windows 7. The new browser can be installed on Windows 7 32/64-bit SP1 or Windows Server 2008 R2 SP1. You require 512MB RAM and up to 120MB of hard disk space. Sorry XP and Vista users — you’re out of luck. The installer itself is a 800Kb file which proceeds to download many megabytes in the background and reboot your PC. It takes a while, although that could have been people like me rushing to upgrade their Windows 7 PCs. But seriously, Microsoft — other browsers download and install in seconds. There’s no (Interface Formally Known As) Metro mode — but you’re not missing much unless you have a tablet. Windows 7 has Aero, Windows 8 offers a simpler UI. Adobe Flash is not natively integrated — you require the plugin. Other than that, it’s much the same browser. Same HTML5 test score of 320+6 / 500, same 100 / 100 Acid3 test result. If you liked IE9, you’ll like IE10. It’s just as fast and offers a full range of HTML5 and CSS3 facilities. While it remains a preview (why the delay? ), IE10 on Windows 7 is a full browser which replaces IE9. If necessary, you can revert back from the Control Panel > Programs and Features > Turn Windows features on or off > uncheck Internet Explorer 10. Only one question remains: should you install IE10? If you only own one test machine, I’d suggest not. IE9 has an 17% market share; IE10 has less than 1%. Besides, IE10 will cause far fewer issues so there’s less urgency to test it. For everyone else — go for it. 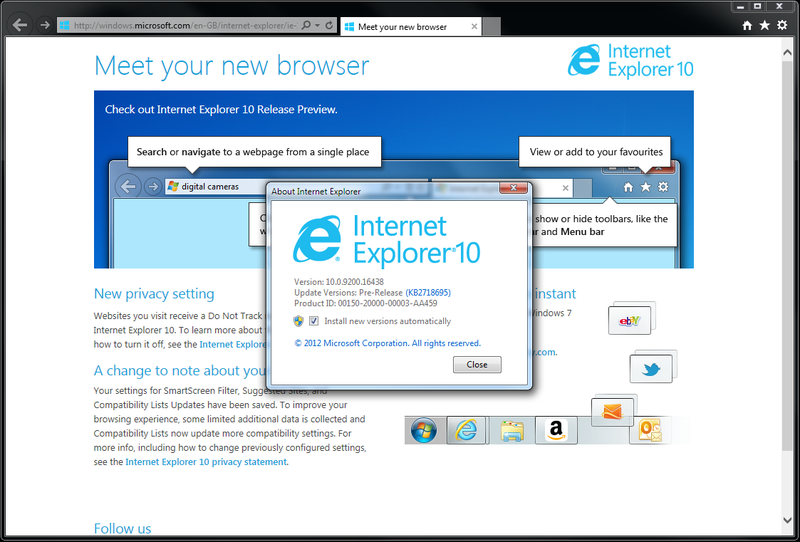 IE10 may be a preview but it’s stable and, whatever your opinion of Microsoft’s browser, it’s better than IE9.